It is well known that chess studies are helpful in training for different endgame positions. One must only collect corresponding studies. The famous chess trainer Mark Dvoretsky has a special card index collected for this purpose, containing a thousand studies. Last year www.e3e5.com announced M.Dvoretsky's jubilee competition in composing studies for practical players to be held in 2007, which is to contribute significantly to the card index. But composers permanently searching for 'golden grains' in endgames, sometimes want themselves to share their doubts, grieves and finds with readers. Below, I shall bring studies published earlier but here they will be presented in corrected form for the first time. I recommend to practical players and their trainers to pay attention not only to the main play but also to various tries, traps and proof variations which can be useful for training in endgames. The position is clear, seemingly not very complex; it could occur in a practical game. Material equality is complete, but see the condition: White must make a draw. It means that Black has at least visual advantage. It consists of the black pawn promotion with a check, and then Black's rook joins the attack and he checkmates easily. An early withdrawal of the white king does not help: 1.ўa6? g1Ј 2.h8Ј Јf1+! with fast checkmating. 1.¦h3+.The rook is untouchable, of course, and in the case of 1...ўf2 2.¦h2 the dangerous pawn g2 would be neutralized. Let us try now 3.h8Ј? g1Ј+ 4.Јd4 Јxd4 5.¦xd4 ўxg6. No, Black wins this rook ending. After 5.¦e4 e5 6.ўb6 the only 6...ўf6! follows. Other moves lead to draw, for example 6...¦g5? 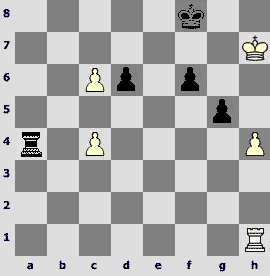 7.ўc6 ўf6 8.ўd6 ¦h5 9.¦e1 with zugzwang, Black cannot strengthen his position. After 3.¦h5+ the king cannot go backward, White has different ways to a draw in this case apart from repeating of the position. But there is a way forward: 3...ўxg6. 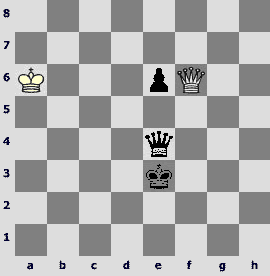 The first little walk is over – systematic motion of the king and rook. Black seems to achieve his goal, going away from the rook's checks. A small step of the king to f7 left to make for win. Let us test an interesting try: 4.¦h6+!? ўf7 5.h8¤+! ўe7 6.¦g6 ¦f8 7.¦xg2 ¦xh8 8.ўb6 ¦h5! 9.ўc6 ўf6! 10.¦f2+ ¦f5 11.¦h2 ¦f4! 12.¦h6+ ўf5!, and Black wins, for example 13.¦h5+ ўg6 14.¦h1 ¦d4 15.ўc5 e5 16.¦f1 ўg5 17.¦g1+ ўf5 18.¦f1+ ¦f4 19.¦h1 ¦f3 20.¦h5+ ўf4 21.¦h8 e4 22.ўc4 ¦a3 23.¦h4+ ўf5 24.¦h8 e3 25.¦e8 ўf4µ. Alas, the nice-looking trap with a promotion to a knight fails. Just now, the long-awaited promotion to the queen is correct! 4.h8Ј! 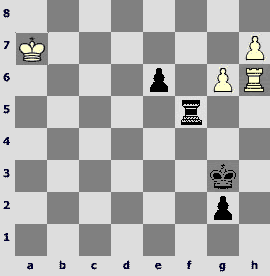 White makes use of the black rook's position in the same rank as the white one. It allows him to escape checkmating attack. 4...g1Ј+ 5.ўa8!The a1 square turns out inaccessible for Black, and his queen can make only diagonal checks staying on the dangerous g-file. 5...Јg2+! 6.ўb8!Now the b2 square is inaccessible for Black. The second systematic motion: the white king moved strictly along the rank, while the black queen in the distance strictly along the file. Now the queen cannot step on c3. 7...¦f8+.The accurate route of the white king allowed to avoid further checks by the queen. On 7...Јf4 will follow 8.Јh7+ ўf6 9.Јh8+ ўg6 10.Јh7+=. 7.Јxf8 ўxh5with full equality after 8.Јh8+ ўg4 9.Јg8+. Draw. The solution: 1.h7 g2 2.¦h3+and further as in No.1, but the king steps on g6 without capturing a pawn. What made us to change the study? In XXI century studies are tested everywhere by modern chess programs, such as 'Fritz'. Although, as Viktor Korchnoi ingeniously said, these programs are 'irresponsible' (change their estimates too unexpectedly), they render invaluable help to composers. Moreover, Nalimov Endgame Tablebases (EGTB) have appeared quite recently. All endgames with 3-6 pieces are calculated in the tables which substitute the well-known base by the American scientist Ken Thompson (positions up to 5 pieces, errors occurring). Evgeny Nalimov is a talented scientist of Krasnoyarsk, now working in the USA. His tables cannot be accused of irresponsibility: they have not found errors in them for the present. When testing fragments of No.3 (up to 6 pieces) with Nalimov EGTB we discovered that the position No.4 arising after 1.h7 g2 2.¦h3+ ўe4 3.¦h4+ ўd3 4.h8Ј g1Ј+ 5.ўa6 Јf1! 6.¦h1! Јe2 7.¦h2 Јe4 8.¦h3+ ¦f3 9.Јd8+ ўe2 10.¦xf3 ўxf3 11.Јf6+ ўe3 which we believed drawn, won by Black in 55 moves! 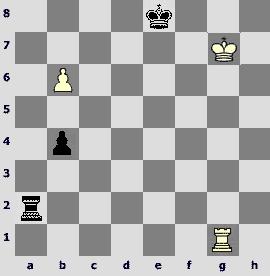 In the case of 9.¦xf3 Јxf3 Black wins the queen endgame in 57 moves. There is no need to demonstrate these variations: one can find them in Nalimov's tables. Using this example, I would like to show how studies are being corrected. Study No.3 was composed three years ago. First, we should have remembered all nuances of the position. 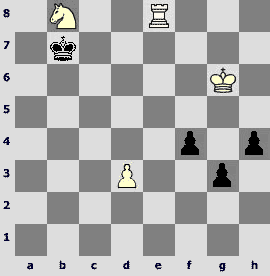 Having checked up the variations, we concluded that White must be strengthened a while by adding a pawn. Such adding must be done accurately, avoiding disharmony. The study was not a miniature any longer but we were not confused about the fact. Our opinion is that 7-piece studies are not much better than 8-piece ones. It is no more than mere arithmetic in most cases. But where we should put a white pawn? It must not prevent the main play; let us try to put it on a2. The main play is all right in this case. The study seems to be corrected easily, but alas, a cunning try connected with a promotion to a knight, turns out to be the second solution: Black cannot win the arising rook endgame. So the added pawn must be eliminated in the process of play. Our attempt to put it on f7 failed. The g6 square turned out the only possible location. Moreover, we had to omit the first move, but, interestingly, the main play remained fully, including the sympathetic try. Defects in studies, so painful for authors, are the inevitable evil. There are no composers to have no 'holes' in their works, i.e. various defects in studies (second solutions, no solutions, duals). A saying ascribed to V.Chekhover was popular before the computer age: there are no correct studies, only still non-refuted! In spite of powerful computerized testing 'holes' occur in modern studies also. Their correction is a procedure not always pleasant, but often useful. First, one's technique of composing undoubtedly improves; second, sometimes a corrected study becomes even better than the initial correct version. If a study remains at the same level after correction, it is also good. Unfortunately, some studies cannot be corrected at all. Let us proceed to other examples. 1.b7 ¦a7 2.¦e1+ ўd8 3.¦e7!! ўxe7 4.b8Ј winning. An excellent combinative stroke by the Czechoslovak grandmaster in composition J.Fritz, but it is too short for a study. No.6 is an attempt to develop it. 1.с5! The c-file must be closed immediately! Changing of move order will not do: 1.hg? fg 2.c5 ¦c4=;1.ўg6? ¦xc4 2.h5 ¦xc6 3.¦a1 ¦c8 4.h6 ўg8=; 1.¦c1? gh 2.c7 ¦a7µ. 1...dc. 1...¦c4 2.cd ¦xc6 3.¦d1! ўe8 4.h5 g4 5.h6 g3 6.ўg7 ¦c4 7.h7±. Another proof variation 1...ўe7 needs more detailed explaining. Proof variations, unlike the main one, do not require White's moves to be unique. In this variation, to my mind, White demonstrates an instructive plan: without distraction, he stubbornly advances with his h-pawn: 2.h5 cd 3.h6 ўf7, and only when Black retreats with his king, follows precise 4.¦b1! ¦a8 5.¦b7+ ўe6 6.c7 g4 (6...¦c8 7.ўg6 g4 8.¦b6+ ўd7 9.¦b8±) 7.ўg6 (7.¦b8? ¦a7!) 7...¦g8+ 8.ўh5 ўd7 9.h7 ¦h8 10.ўxb4±. 2.hg.And the f-file must be open! 2.ўg6? ¦a6 3.c7 f5+=. 2...fg 3.c7 3.¦a7. On 3...¦a8 would follow 4.¦b1 with inevitable 5.¦b8±. 4.¦f1+! ўe8 5.¦f7! ¦a8. If 5...ўxf7 then 6.c8Ј±, now playing continues. 6.ўg7! Just so; will not do 6.ўg6? ¦a6+ 7.ўf5 ¦c6 8.¦h7 c4 9.ўe5 c3 10.ўd5 c2µ or 6.¦g7? ¦c8! 7.ўg6 c4 8.ўf6 c3 9.¦e7+ ўf8 10.¦d7 ўe8=. 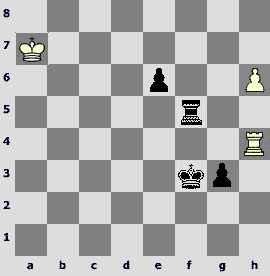 6...¦c8 7.ўf6 winning easily, for example 7...c4 8.¦h7 c3 9.ўe6 ўf8 10.¦h8+ ўg7 11.¦xc8 c2 12.¦g8+±. In No.6 the combinative stroke by J.Fritz connected with the unexpected rook sacrifice, realizes after a masked introduction when a file is being closed and then another one is being opened. Moreover, here play continues after the sacrifice. This position is undoubtedly more pleasant, but alas, it turned out incorrect. The author's solution is 1.с5! dc 2.g5! fg and further as in No.6. However, after the study had been published already, I found rather fine second solution: 1.¦c1! ¦a6 2.¦f1! (earlier I have been considering 2.с7 only) 2...ўe7 (2...ўf7 3.g5!) 3.ўg7 ¦xc6 4.¦e1+ ўd7 5.¦e4 ўc7 6.¦f4 ўb6 7.¦xf6! 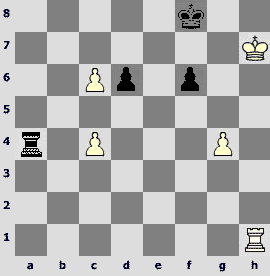 ¦xc4 8.¦xd6+ ўc5 9.¦g6, and White wins. And another my study in conclusion. 1.¦e1! The knight sacrifice is imaginary: 1...ўxb8? ўg5 and the pawns are detained. 2.¦b1+. Too early is 2.ўf5? g2 3.¦b1+ ўa7! 4.¤c6+ ўa6 5.¤b4+ ўa5=. 2...ўc7! Now on 2...ўa7 follows 3.¤c6+ ўa6 4.¤e5 f2 5.¤g4!±. 3.ўf5. Black has no time for 3...ўd6 because of the threat 4.ўg4. 3...g2 4.ўe6! Changing the direction. As on the previous move, too early is 4.¤a6+? ўd6=. 4...f2 5.¤a6+. But not 5.d4? f8Ј, and the a6 square is inaccessible for the knight. Or 2...ўc8 3.ўf5 g2 4.ўe6 f2 5.¤a6 f1Ј 6.¦b8#. This old study appeared in press many times but with the white pawn on d2. Quite recently, I have noticed that in this case the study has a significant defect. After 5...ўc6 White, apart from 6.d4, also wins by 6.¤b4+ ўc7 (6...ўc5 7.¤d3+) 7.¤d5+! ўc6 8.d4! 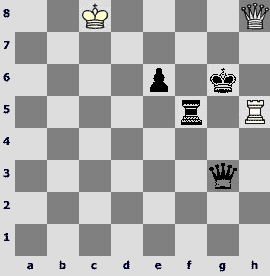 with inevitable mate, or 7...ўc8 8.ўd6 f1Ј 9.¤e7+ ўd8 10.¦b8#. Looks rather nice, but is not needed in the study! The author thanks his readers, especially those who have been reading this article unhurriedly and attentively. I hope it proved to be useful for you.